Sporadic outbreaks of aflatoxicosis occur in dogs when they consume contaminated dog food. During 2011, low-cost brands of pelleted dog food were contaminated with very high concentrations of aflatoxins. Approximately 100 dogs were presented to the Onderstepoort Veterinary Academic Hospital. Clinically, the dogs were depressed to collapsed and icteric, with haematemesis, melaena and haematochezia. The most common pathological findings were icterus, gastro-enterorrhagia and hepatosis. On histopathological examination, fatty hepatosis and bile duct proliferation were observed. A consistent, very characteristic finding was the presence of a blue-grey granular material within the bile ducts. A total of 124 samples of the dog food fed to the affected dogs was analysed to determine aflatoxin concentrations. Concentrations ranged from below the limit of quantification (< 5 mg/kg) to 4946 mg/kg and six samples were submitted to determine the ratio of aflatoxins in the feed. It is estimated that well over 220 dogs died in the Gauteng Province of South Africa as a result of this aflatoxin outbreak. From April to July 2011, a large number of dogs were affected during an AF outbreak in the Gauteng Province of South Africa. Over these months, it is estimated that 100 dogs were presented to the Outpatients Clinic of the Onderstepoort Veterinary Academic Hospital (OVAH), in which aflatoxicosis was strongly suspected based on presenting clinical signs and a history of being fed one of the three incriminated brands of dog pellets, namely Hi-PRO®, Buddy® and Legends®. All three brands are entry level, low-cost pelleted rations and were being sold, relatively cheaply, at petrol stations, vegetable markets, corner shops and similar outlets. The most common complaints cited by owners of dogs presented to the OVAH included anorexia, food avoidance, vomition and lethargy. Owners often commented that the dogs had been reluctant to eat the incriminated pellets, but the dogs were enticed to consume the affected pellets by the addition of meat or gravy. Many owners reported that other dogs within the household exhibited similar signs and had subsequently died before veterinary assistance was sought. On clinical examination of the more acute cases, dogs were depressed to collapsed and icteric, with haematemesis, melaena and haematochezia being commonly observed. In approximately 10% of cases petechiae were present on mucous membranes. The more chronic cases, presented during the second half of June and early July, were smaller breeds that had consumed some of the affected foods, but were simultaneously fed other foods such as table scraps with a resultant diluting effect on the AF-contaminated feed. These dogs presented with severe ascites, pale and icteric mucous membranes, were extremely depressed and often showed severe weight loss at the time of presentation at the OVAH. The vast majority of patients presented at the OVAH with suspected AF poisoning were euthanased because of owners' financial constraints and poor prognosis. The mortality rate of patients admitted for intensive treatment was extremely high as well, with only four patients being discharged. Following euthanasia or death, 31 post-mortem examinations were performed. 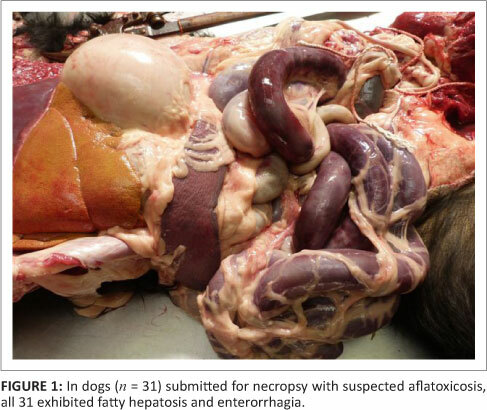 The most consistent findings on macroscopic examination of the carcasses were icterus, gastro-enterorrhagia and hepatosis (31 from 31 cases) (Figure 1). Serosanguinous ascites was the next most common finding (19 from 31 cases), followed by serosal petechiation (13 from 31 cases) and pulmonary haemorrhage (12 from 31 cases). Less common findings were gall bladder oedema (9 from 31 cases), hydrothorax (6 from 31 cases), subcutaneous haemorrhage (3 from 31 cases) and meningeal haemorrhage (1 from 31 cases). 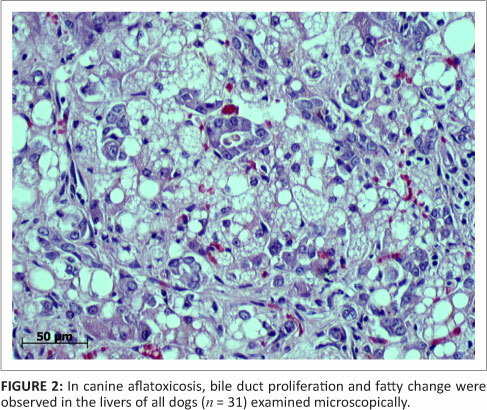 On histopathological examination of the liver, fatty hepatosis and bile duct proliferation (Figure 2) were the most common findings (31 from 31 cases), with lesser numbers showing bile stasis (26 from 31 cases). 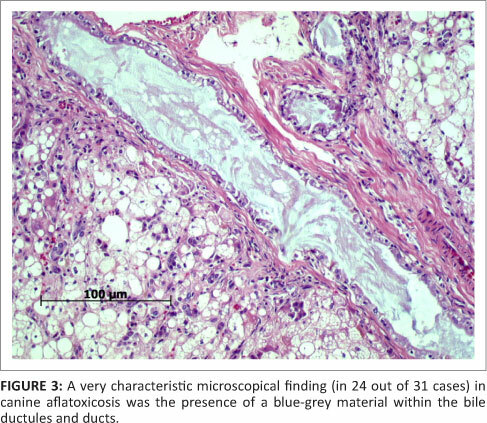 The presence of a blue-grey granular material within the bile ducts was observed in 24 of the 31 cases (Figure 3), whilst 9 of the 31 cases exhibited signs of early portal fibrosis. 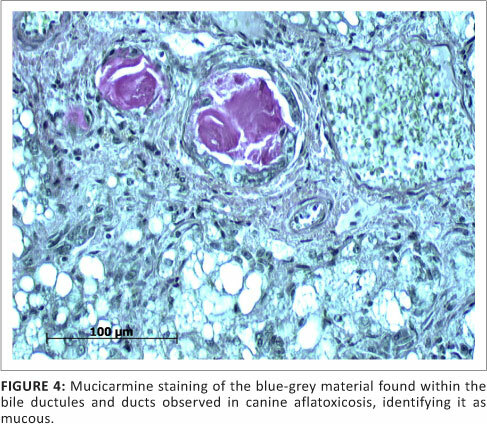 Positive staining of the blue-grey material within the bile ducts with mucicarmine identified it as mucous (Figure 4). Samples of the dog food eaten by affected dogs were screened by the Toxicology Laboratory, ARC-Onderstepoort Veterinary Institute using an accredited ELISA method (Veratox Aflatoxin Quantitative Test, Neogen Corporation, Lansing, USA) for total AF concentration. A total of 124 dog food samples were analysed. 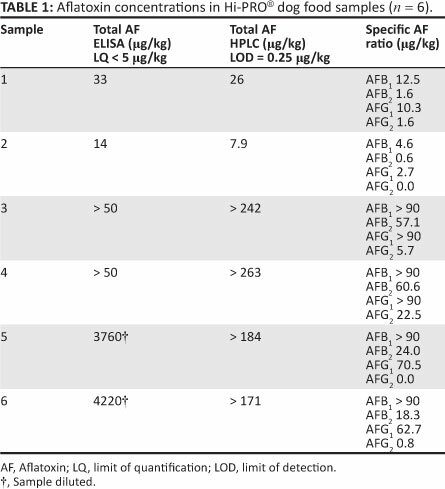 The concentrations ranged from below the limit of quantification (LQ < 5 mg/kg) to 4946 mg/kg and only 29 samples (23.4%) had AF levels below the LQ. The majority of positive samples were Hi-PRO®, but there were also higher than allowable AF concentrations detected in Legends® and Buddies®. Six Hi-PRO® dog food samples were submitted for additional analysis (SANAS accredited HPLC method, Perishable Products Export Control Board Laboratory Services) to determine the specific ratio of the different AF concentrations (Table 1). Very high Aflatoxin B1 concentrations (> 90 mg/kg) were detected in four of the six samples. Regulations pertaining to the Fertilizers, Farm Feeds, Agricultural Remedies and Stock Remedies Act (Act No. 36 of 1947)16 stipulate a maximum Aflatoxin B1 level of 0.01 mg/kg (10 mg/kg) in complete feeds intended for pets. The manager of the feed company manufacturing Hi-PRO® indicated that a batch of groundnuts (peanuts) was obtained at some stage and included at a level of 5% in the feed (Van Vuuren D 2011, personal communication, April 24). It is surmised that the peanuts were the main culprit and explain the exceptionally high levels of aflatoxins determined during this outbreak when compared with previous outbreaks. The inspectorate of the abovementioned Act16 visited the premises and the registrar ordered an immediate withdrawal of the contaminated dog food and suspended manufacturing. A questionnaire to establish the severity and extent of the aflatoxicosis outbreak was compiled and sent electronically to all South African Veterinary Association (SAVA) registered private practitioners via the office of the SAVA. Responses were received from around the country. The majority of cases were reported from Gauteng, apart from a few odd incidents in neighbouring towns. From the questionnaire, aflatoxicosis was diagnosed by private practitioners as the cause of death in an additional 120 dogs. Owing to the sporadic and relatively rare occurrence of such outbreaks in dogs, the initial cases are often misdiagnosed by private veterinarians.3 Clinicians should always consider aflatoxicosis as a differential diagnosis when dealing with dogs presenting with the abovementioned clinical signs. A very conservative estimate of dog fatalities from the recent outbreak is in the region of 220 dogs. However, this is probably only the 'tip of the iceberg', as often only the last remaining dog in the family was presented. In addition, as these dog food brands were entry level, low-cost brands, many dog owners from the poorer socio-economic group in the townships within Gauteng may have been feeding these affected brands. They would not have presented affected dogs to a veterinarian because of a lack of access to veterinarians in these areas, as well as financial constraints, and these deaths would not have been accounted for. The authors would like to acknowledge the SAVA for distributing the Aflatoxin survey questionnaire to all private practitioners who are members and would also like to thank the private practitioners who completed and submitted the questionnaire. L.F.A. (University of Pretoria) performed most of the clinical examinations. N.M.D. (University of Pretoria) performed necropsies and microscopical examination of tissue samples. H.C. (Onderstepoort Veterinary Institute) performed the toxicological analysis. C.J.B. (University of Pretoria) interpreted the toxicological results. C.J.B. (University of Pretoria), L.F.A. (University of Pretoria) and N.M.D. (University of Pretoria) wrote the manuscript.